Sometimes different layers of dirt come off with different solvents and require a double... or even a triple cleaning. 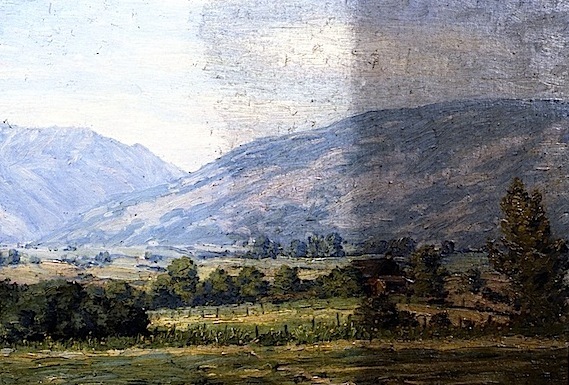 Over the years I have used this photo to show of the stages of cleaning a rural Utah landscape by LeConte Stewart as an example of how, sometimes, a painting can require several cleaning stages to get it completely clean during art conservation treatments. This is really quite a common situation where the solvent that takes off the top layer of crud, doesn’t touch the underlying discolored varnish layer… and sometimes it can be more than two layers! When doing the cleaning tests in order to estimate a budget, this multiple cleaning is usually met with conflicted feelings by the owner: its thrilling to see how big a difference there will be but… the double or triple cleaning process is more expensive. Its part of the price to get the job done right. I can’t tell you how often we have people bring paintings in the art conservation lab that have JUST BEEN CLEANED by someone else… they failed to either know what to do or they didn’t see the additional layer of discoloration left behind after the first cleaning… and the painting still need to be cleaned further. When I cleaned this landscape by LeConte Stewart years ago, I didn’t really know the artist’s work. I’ve worked on a few more paintings by this artist over the years usually through William Karges Fine Art or George Stern Fine Arts. But then, this week, I was meeting with the LDS Museum of Church History and Art in Salt Lake City, UT and they had up a wonderful exhibition of LOTS of Stewart’s paintings. I was really wowed. His artwork, large and small, was of a very nice quality. He was very poetic in interpreting boring rural Utah landscapes into beautiful colors, contrasts, composition and emotions that I would have never thought possible… and was drawn to! His perspectives, draftsmanship and confident execution are consistent throughout the exhibition. It was a real pleasure and inspiration. If you have the chance to get by the museum for the show, set the time aside. I wish the museum would have published a catalog. But they did produce a DVD that is available in the gift shop. This entry was posted in In Lab and tagged LDS Church Museum of Church History, LeConte Stewart, University of Utah Museum of Fine Arts. Bookmark the permalink. Yes, I understand your point and its well taken. I know several instances where a restorer used the multiple cleaning idea as an excuse to change more. Whenever I discuss the need with a potential client, I do a cleaning test and let them see the evidence and have a choice. Some people choose not to have the painting perfectly clean if the first cleaning results in a marked improvement. Thanks Emma for the nice words and for leaving a comment. I would like to say that this write-up was very interesting. I saw the exhibit at the museum and it was great to see your inside information. I always enjoy getting a bit of the behind the scenes. Thanks, very nice article. I was pleased to see this article. We recently had a painting cleaned and I was doubtful that the restorer was being honest with us when we said that he had to clean the painting 3 times. My husband was less bothered but I was sure we were being taken. Your article shows, however, that this can be a normal process and indeed is a process that helps make sure the cleaning is more safe for the artwork. So, thanks for putting my mind at ease, at least partially. Your article is good reading. The website is wonderful, the articles are actually great : D.
Excellent post. I am inspired! Very useful info specifically the part I care for such info a lot about cleaning pictures. I used to be looking for this particular info for a very long time and now by your blog I understand better. Thanks and good luck. I’m a framer and get asked all the time about cleaning paintings. Wow, I had no idea it could be this complicated. While I’ve never tried to do it, now I’m sure I don’t want to get into it. Nice! Since I live in the city, it was great to see the different paintings of the countryside in the video. Your job seems cool, restoring and preserving art. Thanks. Yes, cleaning a painting can be tricky. Not only that, but if you read commentary through out history from dealers, art historians etc, they often remark on how many pictures are ruined/damaged during cleaning. In fact, Vasari, an Italian Renaissance painter and art historian suggested that more paintings have been ruined from inept cleaning than from all the floods, volcanos and earthquakes in the history of the world. Cleaning a painting always seems like it should be something someone should be able to do at home… but obviously it can’t. I guess its the same a body work on a car. You think you can do it… then you get into it and… I guess it matters, also, whether you are trying to do body work on a beater or on a luxury car. I’ll let the professional’s handle this kind of tricky stuff. Thanks for the tips and wake up call. I extremely loved the unusual information you provide for your guests! I’m signed up to hear when you do new posts. Awesome site.